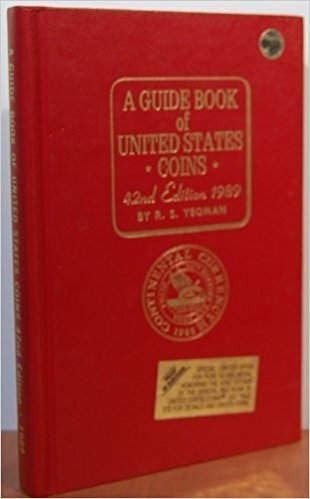 A Guide Book of United States Coins: 1989 42nd Ed. Book Condition: Used/Very Good. Gold sticker peeling off on cover but Book is in very good clean condition. This best-selling one-volume library helps you make smart buying decisions as you build your collection. Millions of readers rely on it photographs, detailed technical data, and up-to-date mintages. It covers the history of colonial and early American coins; official federal issues from half cents through silver dollars and gold coins; classic and modern commemoratives; Proof and Mint sets; error coins; Civil War tokens; pioneer (territorial) gold; every state and territorial quarter; all of the presidential dollars; and more.